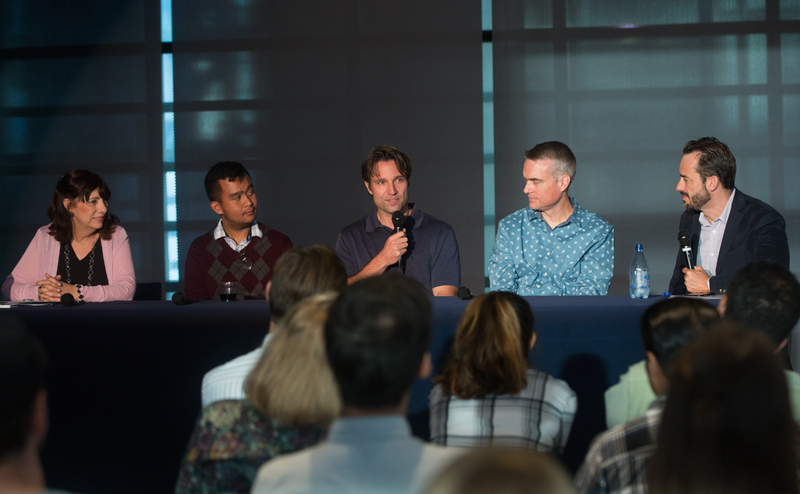 Virtual reality has huge potential as an educational tool in many subjects, but widespread use of the technology in classrooms must await advances in hardware and development of curriculum, experts said during the latest panel discussion in the Sally Ride Science STEAM Series. The event, “Virtual Reality in the Classroom,” was held Sept. 13 at the San Diego Central Library. It was the third discussion in the STEAM Series, which is co-sponsored by UC San Diego Extension and the San Diego Public Library. STEAM stands for science, technology, engineering, arts and math. Watch a video of the event on UCTV. Panel members were, from left, Julie Evans, Kyle Lee, Jürgen Schulze and Rodney Guzman. Julie A. Evans is CEO of Project Tomorrow, an educational nonprofit that works to improve learning opportunities through effective use of science and technology resources. Rodney Guzman is cofounder, CEO, and director of design for Carlsbad-based InterKnowlogy, where he focuses on mobile enterprise, mixed reality, data visualization and solutions relating to the Internet of Things. Kyle Lee is head mathematician at Nanome, a San Diego-based company that builds virtual reality systems to allow scientists and engineers to collaborate with nanoscale precision. He directs the development of Nanome’s virtual reality math education platform, Calcflow. Jürgen Schulze is an associate research scientist for UC San Diego’s Qualcomm Institute and associate adjunct professor at UC San Diego, where he teaches computer graphics and virtual reality in the Computer Science Department. Virtual reality refers to computer simulations of three-dimensional environments that users can interact with in a seemingly real way. Users typically must wear special headsets or goggles during the virtual reality experience. The panelists agreed that the promise of educational applications of virtual reality is great. But they said we are in a period of waiting for the technology to catch up to the potential. “We have a long way to go hardware- and software-wise,” said Guzman. Schulze talked about the “awkwardness” of current virtual reality systems, where a user wearing a bulky headset is completely isolated from the people around him or her. Related technologies such as augmented reality and mixed reality have the potential to overcome this limitation, he said, because they “allow you to see through the display” and maintain awareness of the real world around you. Evans said that the isolating nature of virtual reality runs counter to the spirit of most K-12 education. But, she added, “In K-12 we have a huge push toward personalization of learning.” Virtual reality “has a strong potential to hit on this theme,” she said. Sally Ride Science was founded by America’s first woman in space, along with four like-minded friends, to inspire students, especially girls, in science and technology fields. Sally Ride Science became part of UC San Diego in 2015. Its programs are coordinated by UC San Diego Extension, Scripps Institution of Oceanography and the San Diego Supercomputer Center. UC San Diego Extension and the San Diego Public Library are partnering on the Sally Ride Science STEAM Series with the aim of connecting diverse communities – educators, civic leaders, industry and the public – to promote equity and excellence and to help develop a talent pipeline that will foster regional prosperity. The STEAM Series includes three panel presentations throughout the year.